Are you done staying at hotels and resorts in Goa? Are you now looking for your own private space with the amenities of a hotel? Well, we got you covered. 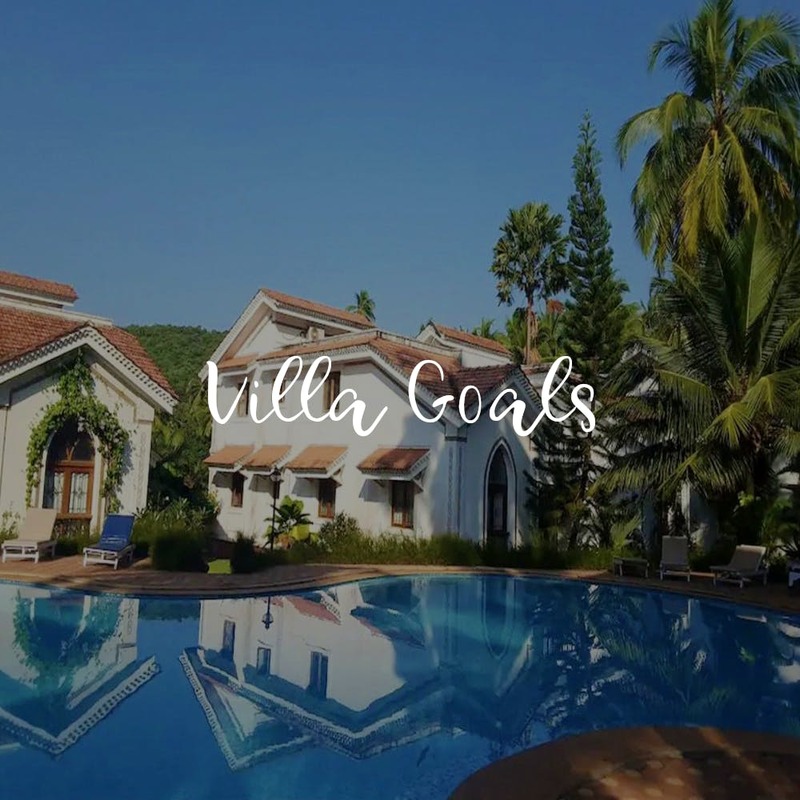 These gorgeous villas around Goa are what you need for your next vacay. This gorgeous, restored 3bhk in Calangute manages to cocoon you from all the chaos on the streets with its traditional balcao, fairy lights and cosy rooms. A maximum of eight people can squeeze into this house whose four poster beds with twinkling lights are absolutely beautiful. It comes with a kitchen that the OYO folks keep stocked with snacks before you come. Our biggest reason for choosing this though, has to be its outside road that leads straight to the cleanest and prettiest part of Calangute beach. Shh… don’t tell anyone. During most part of the year, the per night tariffs really fluctuate at this villa, so it could typically cost anything between 6–15k. This 3-bedroom villa is for friends and fam that love a bit of seclusion and me-time. Its location makes it close to Mapusa, Morjim, Mandrem and Assagao but the more popular beaches like Baga will be a little distant. That said, you’ll thank us for introducing you to this sleepy side of North Goa. Plus, this house can take a gang of six and has a nice pool attached so you can take your time and enjoy the peace that comes with being away from the mad party zones. The rates are pretty affordable too — INR 14k or so for two nights. This elegant and spacious villa comes with three comfortable bedrooms. All rooms come with ensuite bathrooms and the usual air conditioning, TVs, a full-fledged kitchen, housekeeping and 24 hours security. The villa is situated in spacious and serene surroundings, making it very quiet and a perfect place to rest and relax in. Truth be told, we’re a bit biased when it comes to houses surrounded by paddy fields. This one in Baga/Arpora wins for the rustic vibe and the plunge pool that overlooks the fields. With five bedrooms and tariffs that stay around INR 28k a night, we think this one’s a killer deal. They can accommodate four more tiny fellas with extra beds though. If you’re peeps about town, you’ll be in the thick of all the action with Baga, Calangute, Arpora and Anjuna being a short drive away. To wind down after a long day, you can always chill in the garden or play carom or just Netflix on a couch. This villa will make you feel at home the minute you enter. Located in the charming village of Moira, Inner Temple offers a whole new meaning to holidaying in Goa. With luxurious spa services, yoga and delicious food cooked by their in house chef, you’ll be enjoying a susegad life. A private pool with a Portuguese-style sit out makes for an ideal spot for just lazing or having a pool party. All their bedrooms are named after flowers, which were inspirations for their respective design elements. They have an exclusive private room for personalised Ayurvedic and beauty treatments, as well as massages that ensure complete rejuvenation. The villa manager Taryn who grew up here, has loads of stories to tell about her childhood home as well as village tales. For all the serenity and dose of nostalgia, you’ll pay INR 35k for six people where breakfast will be included. Bollywood buffs, this one in Salvador De Mundo might be right up your alley — the film Dear Zindagi was shot here. With a stunning hall, a pool, a courtyard with a fountain and homemade meals, it combines the charm of a boutique hotel, giving all the gang mates enough privacy in their rooms but letting them chill together like a fam during meal/pool/post-dinner chit-chat sessions. This one’s a massive property and a little away from the touristy stretches. It comes at INR 45k (plus taxes) a night for a maximum of 14 house guests. It can also be hired to host parties and events for up to 50 well-behaved folks. A private pool, gazebo, a rooftop, a beer fridge, PS4 and a cool patio… If all these aren’t a part of your Goa villa dreams, who are you even? This 5-bedroom villa in Candolim is ultra luxurious and can take up to 10 part poppers — lucky be the ones who get the master bedroom on top that opens to a gazebo and has a steam room. It’s pretty close to Tito’s, Club Cabana, Britto’s and the likes and Candolim beach is a stone’s throw away (hello, Cafe Chocollati, hey Bomra’s). The tariffs here start at INR 45k a night. Tucked away in a quiet residential colony, Amigos is conveniently located in Arpora, North Goa. With two bedrooms, a living room, a balcony and a common chilling area on the first floor, this one’s as lived in and affordable as they come. The villa can host anything from 2–6 people. It’s also got a lovely pool that the guests get access to and is close to some of the most amazing restaurants and popular beaches like Baga, Calangute and Anjuna. The tariffs start at INR 5.5k but go up depending on the season. Confused on where you could have a grungy pub experience, or where you can enjoy water sports or just grab a quiet, romantic dinner? The hosts have pretty good suggestions. Turiya boutique villa in Canacona, South Goa, is undoubtedly one the most gorgeous properties we’ve seen. With eight rooms in total, divided equally into two wings (heritage and new), it allows you to book individual rooms or the whole villa. It’s close to the beaches and has a patio, a garden dining area, board games, a fully equipped kitchen and a lot of peace. In the non-peak season (May-Sept), you can book the entire villa for 15 folks for as low as INR 29k. They’ve also got a caretaker to make beds, keep you fed and look after your tiny demands. A well-maintained, cosy house in Candolim, Airlinda has four bedrooms, a living room, a kitchenette, wifi and a super friendly caretaker who's been looking after the property for a long time. This is down a quiet lane and gives the feeling of living inside a fancy house that has enough space for everyone. They're also pet-friendly and have a gorgeous private pool on the rooftop that overlooks the forest. Sigh... A night here will set your group of 6-8 by INR 18k upwards.